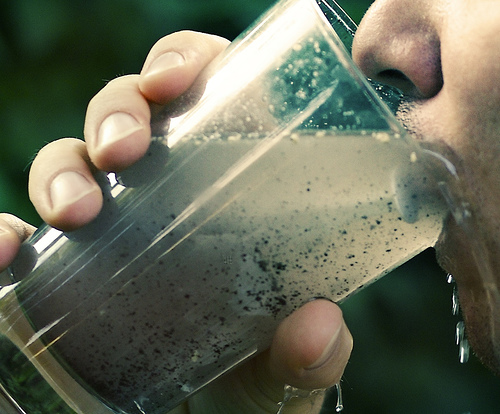 That haunting verse from Samuel Taylor Coleridge’s Rime of the Ancient Mariner is beginning to strike home for millions of people not only in Flint, Michigan and Sebring, Ohio, but in communities all over the world as safe, fresh drinking water becomes harder and harder to find. Schools in Sebring were closed this week and pregnant women and children have been advised not to drink the water after tests found high levels of lead in the local water supply. Flint’s situation is clearly the result of careless and uncaring leadership that chose pumping city drinking water from a toxic river rather than face rising costs of buying water from the Detroit water system. Also coming into play are the 60-year-old water distribution systems in Flint and most other cities across the nation. All are dealing with the original cast iron mains and water lines. Not only are they now filled with new toxins that the old filtration systems were not designed to handle, but because of their age, all are leaching lead. After complaints of bad tasting water and reports of high concentrations of lead found in the children in several Flint families, the city’s water system now remains shut while construction of a new service from Lake Huron is underway. Gallons of bottled water are being trucked into the city daily and property owners are saddled with rising costs for a water service they cannot use for at least another year. Even when that service goes on line, experts say private homeowners should consider replacing the plumbing in their homes rather than continue using the old lead pipes. Indeed, the days of dipping a cup into a pool of clear spring water from the ground or drawing a clear drink from the kitchen faucet are over. The ground water in the United States, as well as all over the world, is now laced with agricultural and industrial toxins that have been carelessly dumped without thoughts of what the chemicals were doing to the aquifers deep underground. Factories, mining operations, electric generating plants, farming operations and even rural home septic systems have been draining waste directly into open streams, rivers and lakes for years. These waters are so polluted today that green algae is found everywhere. Dead fish and other sealife can be found floating along our coastlines. Even more disturbing has been the advent of nuclear power plants and the high volume of radioactive isotopes spewing from them all over the world. Meltdowns and near meltdowns at Three Mile Island, Pennsylvania, Chernobyl, Ukraine and Fukushima, Japan have literally poisoned the air, the ground and the seas. The Japan disaster is still going on and there does not appear to be any known way to stopping it. Workers risk their lives just entering the grounds. A special robot is going to be sent into the plant this month in an attempt to get images of the disaster area in hopes that some kind of solution can be found. Consequently to all of the above, the seafood we once enjoyed is now under suspicion. Not only are the fish, crabs, clams and shrimp laced with radioactivity, but the creatures also are being poisoned by the massive blow-outs at underwater oil and gas well drilling platforms going on around the world. The sea life is not only poisoned, but it is dying. The food we grow on industrial farms is not only laced with toxic chemicals but because it is genetically altered, it is robbed of natural vitamins and minerals we need for good health. Our warming planet is causing extreme changes in the climate, which also is affecting the success of farm operations. Crop failures are more and more common. Popular foods like coffee, cocoa, apples, potatoes, rice and even beans are threatened by a heating climate. When my family and I lived for a while in Arizona in the 1990’s we became acutely aware of the value of fresh water. Every stream fed small aquifers owned by local farm groups. The owners were protective of every drop of water in those ponds and artificial lakes. The water was used to provide drinking water to nearby communities and feed livestock. All over the high desert across the Navajo Reservation could be seen windmills standing next to steel watering troughs. The windmills pumped water from a fresh water aquifer deep underground. Livestock graced on open land there, and all animals drank from those troughs. There was a controversy going on about the water in that aquifer even then. It seems that the Peabody Coal Company was paying for native labor to strip mine coal found in the area, and then using high volumes of water from the aquifer to send the coal along open sleuths to coal burning electric power plants in the southwestern part of the state. The natives were complaining that their wells, even then, were going dry. The situation has become so serious that it has become a political nightmare for state legislators. U.S. Senator John McCain was recently driven from a public meeting with Navajo activists because of a spill from the Gold King Mine that contaminated the Animas and San Juan Rivers with lead, mercury and arsenic. Later, when we lived in Michigan’s Upper Peninsula, there was controversy going on between the environmental groups and a Canadian mining company about plans to develop a new mining operation near Marquette. The Lundin Mining Corp was in the process of opening a nickel and copper mine and planned to dump volumes of toxic slush into the Yellow Dog River, which emptied into Lake Superior. That river and Lake Superior are among the few remaining places to find pristine fresh water. The Republican dominated State of Michigan, anxious to provide jobs and see more money flowing into the territory, was allowing the mine. The last we heard the case was in litigation. All of the other Great Lakes are filled with industrial and agricultural toxins, as are the world's oceans. While living in Northern Michigan we felt that we could still safely enjoy fresh fish caught on Lake Superior. We stopped eating fish dinners after we left that area. In addition to Flint, many of the major cities in the United States are listed as being in danger of running out of fresh drinking water. They include Los Angeles, Houston, Phoenix, San Antonio, San Francisco, Fort Worth, Las Vagas, Tucson, Atlanta, Miami and Orlando. Other major cities in the world also in danger of going dry include Tokyo, London, Cairo, Sao Paulo, Beijuing and Mexico City. These are the cities on the endangered list. We can be sure there are many many more. Such fools are we. When the fresh water is gone money will be worthless to us all. We cannot drink it. A day is soon coming when we might pay a fortune for a good cold drink of fresh water.